Resin is the common name for a class of casting polymers typically requiring two parts. When the two parts are mixed, they produce a chemical reaction and generate exothermic heat, causing the fluid material to harden and fuse into a solid form. The result is a type of plastic. There are many types of resins available, and new formulations are continually being developed for various uses and applications. The color, strength, pouring viscosity and many other factors vary among formulations. The resin we use is a two-component, abrasion-resistant, self-leveling epoxy coating that when mixed together will harden into an extremely durable plastic. The product is high-gloss, non-porous, and emits no VOC’S (Volatile Organic Compounds). It adheres to smooth concrete, wood, and steel with excellent results. It can also be applied over uneven or rough surfaces for a different effect. It is safe to use with under floor heating. 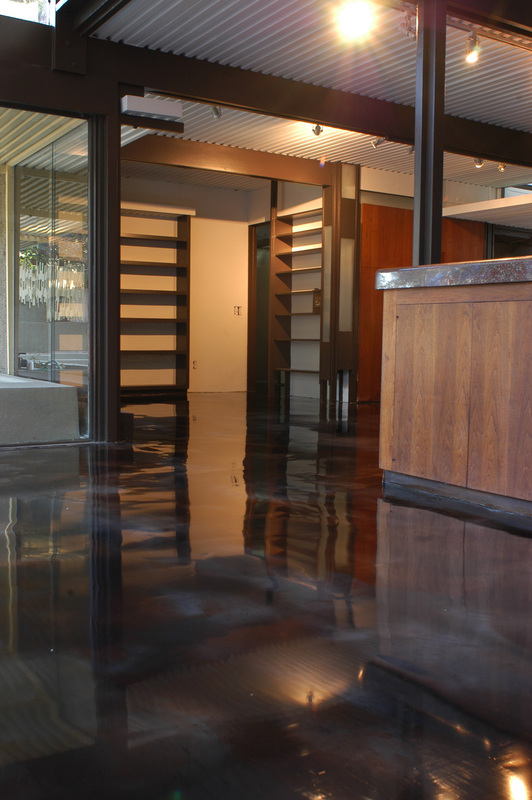 The floors are slip-resistant, scratch resistant and require low maintenance. We apply our resin in three coats. Installation takes 3-4 days as each coat takes 24 hours to harden and dry. Each layer we apply creates more depth of color and transparency giving our floors a 3-dimensional organic quality. Every floor is completely unique due to the characteristics of the resin application, the floor surface and the colors. Our resin floors are a vision for interior designers, architects, and individuals looking for unique floors with lasting impact and a healthy living environment for their client. Our resin floors are equally at home in high-end showrooms, hotels, galleries, boutiques, restaurants, offices and residences. Please e-mail us to set up a consultation and to see samples.